The Weather Channel aired a one hour “Tornado!” last night, which I thought would be a structured documentary on the recent outbreaks, but in fact it was mostly a current news program. It started reporting from El Reno, OK on the tornado swath through the state. Later it showed the funnel clouds above Love Field (home of Southwest Airlines), near the Oak Lawn section of Dallas, when the entire terminal was evacuated after planes were emptied. Much of the rest of the broadcast dealt with Texas, as the storms moved east of the DFW Metroplex, rather than with the possibility of recurrence over Joplin, MO, which Anderson Cooper had covered earlier in the evening (see the TV blog). The 1996 film "Twister" by Jan de Bont (WB; Spielberg was executve producer, written by Michael Crichton) seems all to true now. CNN's coverage (much more than Weather Channel) has emphasized that winds of this magnitude (in an F5 tornado) are not survivable, much as a tsunami is not survivable. One victim literally "went up" through a car sun roof window, sucked out of the car as in a horror film, possibly carried in the winds for miles. This is possible with winds over 150 mph. It has become impossible for rescuers to identify victims found miles away, even those alive (CNN report Wed. night, AC360). CNN has also covered the damage to St. John's Hospital in Joplin in detail. Wikipedia attribution link for Tornado Alley frequency map (pd). CNBC covers Fukushima in one-hour "Nuclear Meltdown"
CNBC’s one hour documentary on catastrophe at the Fukushima Nuclear Power Plants severely damaged by the tsunami that followed the 9.0 offshore March 11, 2011 earthquake, is called naturally enough, “Nuclear Meltdown”, having aired first on May 18, and again May 22, pre-empting some more “popular” shows. The plant simply wasn’t built to withstand a tsunami of this size, which destroyed the backup power needed to cool the reactors. It still isn’t clear how many other seaside reactors around the world could have such an exposure, when one considers that a 100 foot tsunami from a Cumbre Vieja volcano in the Atlantic might be theoretically possible, from an avalanche. It’s also interesting to note how the radiation exposure to workers on the cleanup was managed, and that older workers, past reproductive age and with fewer life expectancy years to be lost to possible radiation exposure. It’s unpleasant to think about how democratic societies have to ration sacrifice. Still, the one power source most consistent with not adding more carbon to the atmosphere is nuclear. Here’s a video from Russia Today of the tsunami hitting the plant. On May 17, PBS aired a frightening episode from its “Secrets of the Dead” series: “The World’s Biggest Bomb”, focusing on the Czar device detonated by the Soviet Union over an arctic island on Oct. 30, 1961. The 50 megaton device produced a mushroom cloud that went 40 miles up. Compared to most devices even discussed in today’s warning (as by Graham Allison) about nuclear terror (which presumes much smaller devices), the device (if exploded at 2000 feet altitude) would have produced total destruction for at least a 3 mile radius and destroyed most buildings for 12 mile radius. The designer, Sakharov, had reduced the yield down from 100 megatons. The documentary also covers the 1954 hydrogen bomb test at the Bikini Atoll (destroying a small tribal kingdom after evacuation and making the place permanently uninhabitable) of Castle Bravo, 15 megatons. From the Soviet blast, there is controversy about the fallout, which stayed in the troposphere for a very long time. Buildings were damaged 300 miles away. Could weapons like this have been fired as a result of the Cuban Missile Crisis in 1962? If so, there would be no civilization today. The documentary didn't cover the EMP issue. The PBS link is here. The WETA link is this. The fall of 1961 was a very trying time for me, resulting in a college expulsion, as detailed elsewhere in my blogs. CNN: :Inside the Mission: Getting bin Laden" and "In the Footsteps of bin Laden"
“CNN Presents” has aired a documentary, starting May 7, “In the Footsteps of bin Laden”, with transcript here, and then later, “Inside the Mission: Getting bin Laden”, with Chris Lawrence, which aired Saturday night at 11 PM EDT. Oddly, CNN did not seem to have a separate website for the second broadcast, but did have a Blogger entry mentioning it, here. Nic Robertson, Peter Bergen, Michael Hayden, and Gary Bernstein appear. The show also discusses who one courier became his downfall, and how his dependence on a third party to make electronic contact with the outside world ultimately depend him in. That’s an ironic development, given today’s discussions about Internet “privacy”. Bin Laden surprisingly spoke of the "Arab Spring" in his notes. According to the latest bulletins, CNN will reair this Sunday May 15 at 7 PM EDT. “Kill Shot: The Story Behind Bin Laden’s Death” aired tonight on ABC 20/20 as the closest thing yet to a “movie” about the “hit” Sunday night on Osama bin Laden. (Yup, it answers Morgan Spurlock's "Where in the WORLD is Osama bin Laden" as well as Michael Moore's "Fahrenheit 9/11". The report comprised a series of short clips, including an animated recreation of the “event”. The only “firefight” happened on the first floor, and Admiral McCraven led the raid from the Pentagon by radio (or high speed wireless satellite Internet, in a sense). ABC included a report on the use of dogs, equipped with high tech gear and even replacement titanium tooth implants in some cases. The bonding with canines is part of Seals and Special Ops “unit cohesion”. The ABC report also examined how well movies have approximated raids like this, and Ridley Scott’s “Black Hawk Down” from Columbia (with Josh Hartnett as the gentle Sgt. Eversmann) in 2001 comes about as close as any. ABC also offers a 1998 interview with bin Laden, where he warns that his “fatwa” will not distinguish between civilians and uniformed personnel. Nightline reports that there was a secret CIA safehouse in Abbottabad. Osama was called “The Pacer”. An interesting aspect of all this was how personnel estimated bin Laden’s height, to help verify his identity. 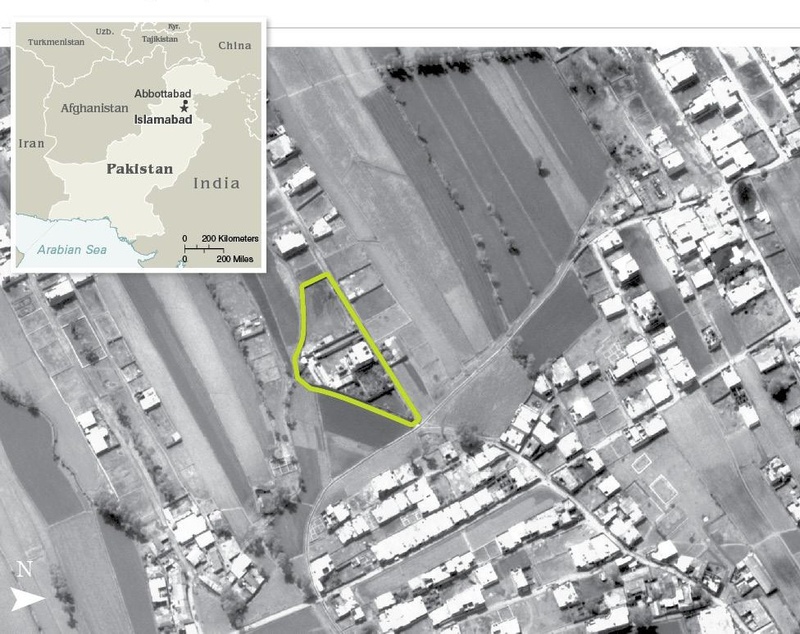 It appears that Osama bin Laden was actually shot at about 2 AM Monday May 2 Pakastani time (source http://wiki.answers.com/Q/FAQ/9372). I believe that was 5 PM Sunday afternoon EDT in Washington DC. The Nightline report showed the White House “jubilation” at the time. Another description link for ABC’s materials is here. 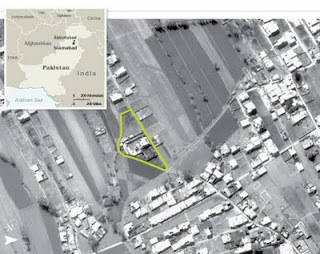 Wikipedia attribution link for CIA aerial photo of Bin Laden compound.